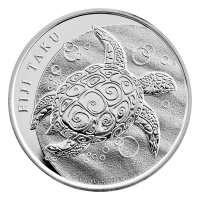 Buy 1 oz 2012 Fiji Taku Silver Coins | ?? 1盎司2012年斐济塔库银币 Minted by the New Zealand Mint, these are Fiji's official silver Bullion Coins, with a $2 face value. The Hawksbill turtle (Eretmochelys imbricata bissa), or locally named Taku, is one of two main turtle species of the South Pacific island nation of Fiji. Although they have a wide distribution throughout the world's tropical regions, Hawksbill Turtles are considered critically endangered due to human fishing practises. Taku grow up to a metre in length and a weight of 80 kg, although the heaviest on record weighed 127 kg. The obverse of the coin features the Raphael Maklouf effigy of Her Majesty Queen Elizabeth II, sovereign of the Commonwealth and Fiji. The reverse features a Taku with a stylized shell pattern swimming through the waters of the Pacific Ocean along with an engraved heading and the coin's metal quality and weight.